Computer-based training enables employees to take training from any location. Includes short, customizable modular videos allow employees to complete training in multiple sessions as time permits. Training topics & layout can be tailored to address specific audiences. Support materials allow you to reinforce training through alternative methods. Language options offer consistent training across your entire organization regardless of geography. Module quiz questions test learner comprehension. Completion reports allow you to track completion for compliance reporting purposes. Lucy comes with different awareness templates. The templates can be found in Settings (/admin/settings/awareness-templates). The template list is continuously growing. If there is a topic missing, please get in touch with us and we will create this within a short time frame. Note: Not all awareness templates are available in the different LUCY editions. Please find out which templates are available before purchasing LUCY. If you do not find the template in the list, we can also create it for you on request. Create a new e-learning using the adapt authoring tool. Click here for more info. %started% — Date when the related campaign has been started. %stopped% — Date when the related campaign has been stopped. LUCY comes with a short minutes eLearning video (here an example of a English version: https://www.youtube.com/watch?v=2z9mPh5QYWI), that can be embedded within any page in LUCY. This video can be fully tailored to your needs and have your own branding. See this chapter for more details. Mixed Interactive Quiz (phishing email detection quiz): this template contains multiple customizable sections (Info, Tips, Quiz, Video). The QUIZ contains mainly phishing mails. You have a separate language dropdown menu option within the page (can be disabled) in case you cannot determine in advance what language the user might speak. Other customization options are defined as well in this tutorial. Lucy Interactive Awareness (phishing web site detection quiz): this template is contains an interactive phishing QUIZ. The QUIZ contains mainly phishing websites and asks the user to spot them. More details about those pages can be found here. Awareness template can also be dynamic. Lucy is able to track answers and time users spent on each answer. Answer information can be viewed later on the Awareness Statistics page in your campaign. In order to integrate Lucy interactive tracking please check out this chapter. By default LUCY will use the IP address of your server to host the eLearning content. But you can replace that with any domain name. You can either use a FQDN like www.myteaching.com or just a domain name like myteaching.com. In both cases you must make sure that the domain name is pointing to LUCY's IP address. This is done automatically if you register the domain within LUCY. If you registered the domain using a third party provider you need to adjust the settings there. Use the build in mail Server (postfix). Disadvantage: users might not trust the mail sender. E-Learning tracking is possible. Use the companies mail server (relay). Details here. E-Learning tracking is possible. b) Create a static eLearning link and distribute it wither via mail or place it on a website. You can also create a static link and distribute it via mail (e.g. your own mail server or place it on an intranet site). Disadvantage: individual user tracking is not possible. Please check the subchapter “Manually send out eLearning using your own company email account” on this WIKI page. eMail: If you want to send out the eLearning mail in association with a successful phishing campaign, you need to activate the checkbox “send Link to Awareness website automatically” within scenario settings. This requires that LUCY has triggered a successful attack. Details how to register a successful attacks can be found here. Redirection: Redirect the user directly to the awareness page without involving a mail. This is done by using the %link-awareness% variable within the landing page or the redirect input field. d) Start an eLearning campaign without starting a phishing simulation. Send Awareness By Click Rate (1): You can specify, the required historical click rate to roll out the awareness. Example: If you specify 50 %, the user will only get an awareness email, if he clicked at least on half of the links sent to him in a phishing simulation. Send Awareness By Success Rate (2): The success rate works same as the click rate, only that a different success action is used to initiate the E-learning. 1b) Then select the Awareness website in the template which you would like to send to your users. Please activate the website (“website enabled”) by selecting the according checkbox. Please note: you will first need to define the success action, so LUCY knows what a successful attack is and hwen it should send the eLearning content. 1c) Now you need to define the message template which contains the link to the awareness course. In order to track users, you will need the %link% variable within the message template. Please note: you can also use the static link displayed under the awareness website configuration. But if you use a static link you loose the ability to track the users. Note: In a campaign where you use two pages (e.g. page 1 is a login page, and page 2 is the authenticated page), you should insert the redirect script on page two. Otherwise the user will get redirected before he is able to login. You can have LUCY send you the e-learning e-mail by starting an awareness only campaign. Please click here to learn more about this topic. 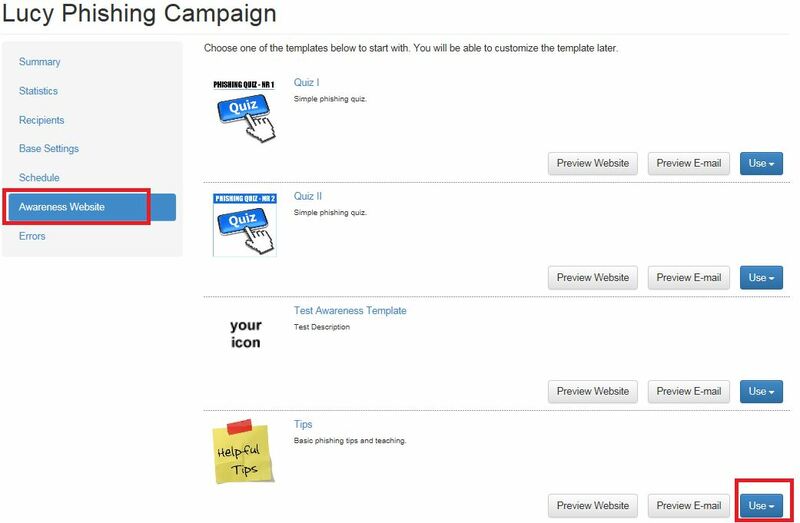 Within your campaign go to the awareness section (1) and select the awareness template of your choice, then click on the checkbox “enable website” (2) and save the settings (3). Now go to the website menu (1) and configure the IP or domain name (2) that you want to use for your eLearning site (make sure the IP or domain points to LUCY!). Next save the settings. Now you should see the link (3) to your eLearning site with the according IP or domain. You can copy that link and paste it into your company's mail. Please note that you will loose the ability to track the individual eLearning statistics when you use the same static link for every user. If you want to track the eLearning, you need to use LUCY's to deliver the mail with the awareness content. Lucy offers the possibility for each recipient to create an individual login page where the user can see his training content. More info here. All e-learning templates can now be exported using the SCORM format, allowing you to use the LUCY content in your own LMS. SCORM (Sharable Content Object Reference Model) is the most commonly used content standard in eLearning. Since it was released 16 years ago, the SCORM specification has worked to standardize learning content between the industry’s many developers and vendors. When you click on the learning template you will see a button called “Export to SCORM”. This allows you within the general template section or within the actual campaign, to export your awareness template. The SCORM export then can be downloaded as a ZIP file from the export section. Based on the amount of successful attack simulations for an individual user, you can assign a specific e-learning template in LUCY. If a user didn't fall for a phishing simulation yet, you might want to assign a different e-learning content than for a user who continuously submitted sensitive data in previous phishing simulations. Please visit this chapter for details. Anything not “Initially Visible” when the page loads will not be read by a screen reader. Ability to change font sizing for those who may need to see text at a larger size. Color contrast for those who are colorblind or have trouble determining different colors. We provide captioning and transcripts of audio as well as descriptions of any video. Most courses are structured consistently. The training library should give employees the opportunity to download their training content from an overview page called “training library”. The large selection of regular e-learning templates in LUCY serves as learning input. The overview page can be sorted by certain topics (video, quiz, test etc.). Please read more about this topic here.